Delivering a baby is hard work—that’s why it’s called labor. Although a C-section might be easier, how does it affect the baby’s health? The normal birth process has advantages and disadvantages for mother and child. When uterine contractions begin, it triggers physiological changes. The mother’s body produces hormones like oxytocin, which helps the uterus contract to prevent bleeding after delivery and promotes the flow of breast milk. As the baby travels down the birth canal, the contractions help squeeze out placental fluid that can cause breathing problems. During childbirth, the baby swallows bacteria to help develop healthy intestinal function, boost immunity and strengthen the immune system. A surgical solution was once used only when the mother was dying or immediately after death; C-sections could save the life of the child. 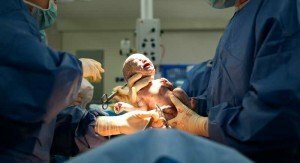 After modern anesthetics, antibiotics and safer surgical techniques were developed, the risks of a C-section decreased and the procedure could be used to deliver a healthy baby and also save the mother. Today, C-sections are sometimes seen as a convenience. They may be used even in a mother who has no medical indications. In the US and in other countries like Austria and Germany, close to one-third of all births are by C-section. A C-section is a major surgical procedure. Like all surgeries, it carries the risk of infection and anesthetic complications. Women who have C-sections are more likely to develop blood clots after surgery and may have increased pain, blood loss or bowel or bladder injury. A C-section also means a longer hospital stay. In many cases, the rule of thumb is that once a woman has had a C-section, she must continue to have C-sections because of an increased risk that uterine muscles may rupture. Vaginal births also carry risks for the mother including bleeding, torn vaginal tissues, lingering pain or muscle injuries that can result in leakage of urine or stools. The baby may suffer birth injuries, especially if the child is large or the birth process lasts many hours. For the otherwise healthy mother and baby in low-risk situations, there are distinct advantages from a vaginal birth, particularly for the baby. A large study that took place in Scotland and was published in the Journal of the American Medical Association tracked children from first-born full-term births over a period of 15 years. 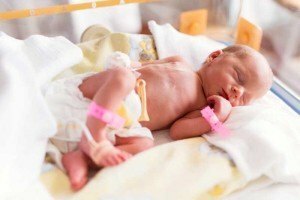 Babies born by vaginal delivery were the healthiest, followed by babies who were born by emergency C-section after the mother had labored for a few hours. Babies born by planned C-section had the most health problems. The Scotland study showed that all babies born by C-section had an increased risk of type 1 diabetes. Babies born by planned C-section had a 35 percent greater risk of type 1 diabetes compared to children born by emergency C-section after a period of labor. Asthma rates, inhaler use and asthma hospitalizations were also higher in planned C-section babies. C-section babies were more likely to be obese by age five compared to children delivered vaginally; the rates of obesity were similar for both planned and emergency C-sections. Women who have diabetes are more likely to have C-sections and this could also affect obesity rates. C-sections may be recommended for women who have health problems like diabetes or high blood pressure or who are carrying more than one baby. When a mother has HIV or herpes, the risk of infecting the baby is relatively high and this may also be an indication for a planned C-section. Bleeding for placental problems may also mean that a planned C-section is necessary, and women who have had previous complicated vaginal births may sometimes need a C-section. Once a woman has started the childbirth process, an emergency C-section may become necessary if the baby is very large, isn’t getting enough oxygen or if the placenta suddenly tears away from the uterus. Every woman should make a decision about a C-section with her doctor or midwife. The ultimate goal should be a live, healthy baby and mother. In the long run, labor is a good thing for mother and child, even if it eventually ends with a C-section. Baby Health and the Month of Conception: Is There a Connection?